Regardless of whether they're referred to as lane change accidents, blind spot collisions, or lane departures, sideswipe truck crashes can be devastating. may be caused by the vehicle driver’s loss of control. 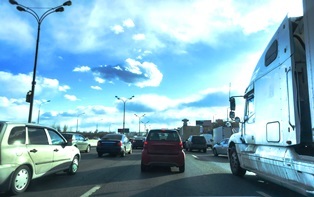 Sideswipe collisions often occur during lane changes and mergers, or when a large truck sideswipes a vehicle coming from the opposite direction. Commercial truck drivers are more likely to cause sideswipe accidents, since they have substantial blind spots on the front, back, and sides of the truck. These blind spots may prevent a trucker from seeing the cars in adjacent lanes, making lane changes and turns far more dangerous. It's a complex process to identify responsible parties and gather necessary evidence to establish liability in truck sideswipe accidents. Both the trucker and the trucking company may be held liable for damages. These accidents often result in serious injuries including head trauma, whiplash, neck issues, and spinal complications. If you were injured in a sideswipe truck collision, you’re entitled to compensation for medical bills, lost income, and pain and suffering. To learn more about what the law offices of Steve M. Lee, P.C., can do for you, visit us on Facebook.